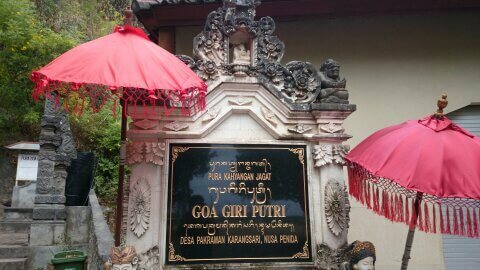 Giri Putri Cave Temple is situated in the pekraman village of Karang Sari, Suana Village, District of Nusa Penida, Klungkung Regency, Bali. The cave entrance itself is located on a high limestone hill. To get there, visitors have to step up upon stairs uphill until arrive at the entrance shrine. The word "giri" means hill or mountain. While the "putri" means princess or beautiful woman. Giri Putri is a symbol of the power of God that is motherly and often called Hyang Giri Putri. 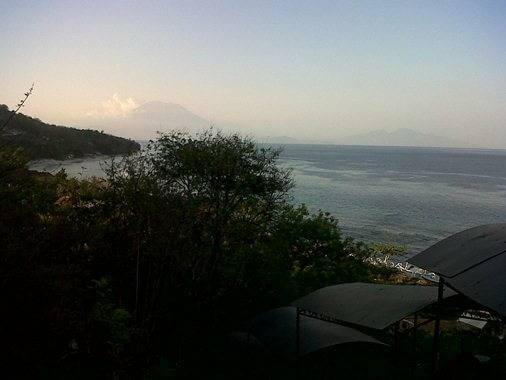 While taking a breath, visitors can enjoy the panoramic beauty of the sea, the beach, fishing boats, and also the beautiful Bali mountains. The cave entrance is relatively small, declining, winding and only passable for one person. Visitors will walk squatting for a few steps then stand up without a head knock. It is because the ceiling of the cave becomes higher. Once stand up and walk for a while, visitors will see the beautiful scenery of the cave, big cave ceiling (so high, wide and broad), hundreds of swallow and of course the lovely bats. In some corners there are stalactites and stalagmites. There are also water droplets being collected on container for the purposes of worship. 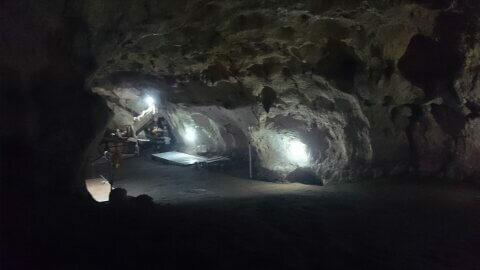 The condition inside the cave is supported by electricity lamp. The temperature inside is cool and the floor is slippery, need to be caution. Goa Giri Putri located at an altitude of 150 meters above sea level, has a length of approximately 310 meters and there are 6 places of worship in it. This place is very sacred, highly respected, full of spiritual vibe, and recommended for lovers of spiritual tourism. 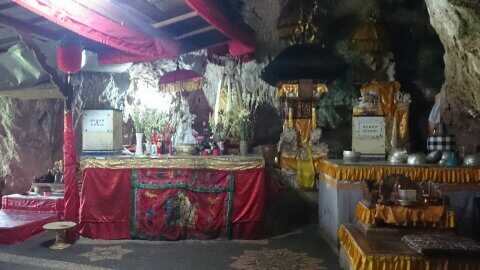 The shrine includes pelinggih Hyang Tri Purusa, pelinggih Hyang Wasuki, pelinggih Hyang Giripati, pelinggih Hyang Giri Putri, pelinggih Hyang Siwa Amerta, and pelinggih Sri Sedana / Ratu Syahbandar and Goddess Kwam Im. After praying visitor heading towards the exit which has larger size compared to the entrance. Overall, this is a fusion concept of holy cave of the Hindu Shiva and Buddhist. Many people came to Pura Giri Putri to pray for safety, prosperity, good fortune, peace and domestic harmony.